Friday evening at Sail Mhor and with a splendid forecast for the morrow plans were well and truly being hatched. Anne C's car was already located at Gruinard Bay in anticipation of a traverse of Beinn Dearg Bheag and Beinn Dearg Mor from Corrie Hallie with Richard and Sophie. Gillian and Cathy joined in this trip, but with an earlier start which enabled "second breakfast" and "first lunch" to be accommodated before being caught up at Larachantivore. 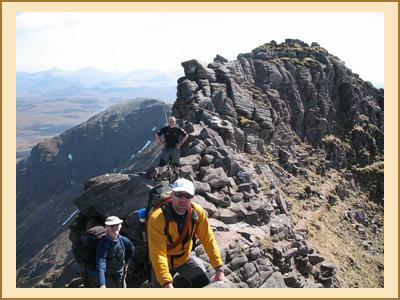 A fine traverse with a lovely ridge to finish on. Not perhaps the obvious choice of walk for Cathy who had only been on the one hill walk in the last year but still managed to ascend Sail Mhor the next day. 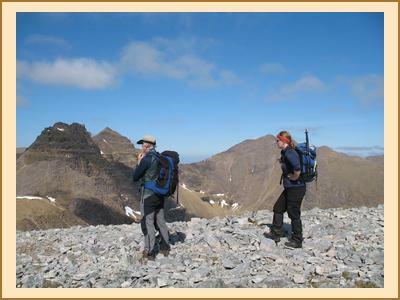 Helen and Richard F had headed for Beinn Mor Assynt and Connival, although without Helen's rucksack which had been left behind in the hostel. Luckily, however, Helen was able to quickly locate enough walking gear casually strewn around in the car to enable the walk to continue once it had been packed into Richard's happily voluminous rucksack, the compass problem being easily solved by a short 25 mile detour to Lochinver and its pie shop. Alan R and Fiona M meanwhile opted to climb. Sunday was equally beautiful with Alison C and Kenny heading off to climb and Martin to be dropped off round the coast by Cathy to facilitate a walk through to Sail Mhor, his route looked beautiful. Helen, Richard, Ron and Penny headed off for an ascent of Fionn Bheinn, a rucksack check having first being carried out at the hostel. Anne C did Am Faochagach (via the ridge described by Martin in his "Scottish Mountaineer" article). Fiona M headed off for the Corbett Bac an Eich (hopefully tic free - see Mol Mor report 2008).